The Pest Force has Master Termite Technicians, as well as, technicians who have received specialized training and testing in performing CL-100 Wood Infestation Reports which are required in most real estate transactions. Wood Infestation Reports should be ordered within 30 days of closing. The Department of Pesticide Regulations at Clemson University is the enforcement and investigative authority in the state of South Carolina for pesticide use, alleged pesticide misuse, sub-standard termite treatments, and wood infestation reports. They offer the following guide for homebuyers, sellers and builders concerning CL-100 Wood Infestation Reports. Exactly What is a Wood Infestation Report? A Wood Infestation Report is a report of visible infestation and damage caused by insects (e.g., termites and beetles) and decay in accessible areas of the structure, with the inspection for decay fungi limited to the portion of the structure below the level of the first main floor. It informs the lending institution and buyer of the results of an inspection by a Pest Control Operator. As a protective measure, banks and lending institutions require that homes be inspected for damage from termites and other wood-destroying organisms before they will loan money on the home. Is there any visible evidence of infestation or previous treatment? Are there any obstructions or inaccessible areas which cannot be inspected? Was a builder contacted to assess the damages? The second page of the Wood Infestation Report provides space to comment on details regarding data disclosed on the first page of the report. It identifies special areas of concern, such as locations of previous treatment, and it identifies areas that are inaccessible for inspection. Damage on a Wood Infestation Report is a Bad Thing, Right? Homeowners are usually reluctant to admit to potential buyers that their homes are damaged by termites. For some people, the words “termite damage” bring cartoon visions of flying sawdust as tiny insects with large teeth gnaw their way through a home. Fortunately, this image is far from accurate. Even if a significant infestation of termites are present, only a small amount of additional damage will occur in the time it takes most people to come to a careful decision about treatment. Damage that has been properly repaired or judged to be not structurally significant should not interfere with the sale of the house. Just as most used cars have a dent here and there, most South Carolina homes that are over 10 years-old can reasonably be expected to have some wood-destroying organism damage. Does a Wood Infestation Report Guarantee an Absence of Termites? No. This report is simply a description of any visible activity or damage caused by termites or other wooddestroying organisms. The inspection is based on careful visual inspection of readily accessible areas and by sounding or probing. A qualified building expert should be consulted to determine the extent of damage and whether repairs are necessary. Most Pest Control Operators are not builders. The Wood Infestation Report is sometimes inappropriately referred to as a “clearance letter” or a “termite letter.” It is not a “clearance letter” in that it does not necessarily “clear” a structure. It is not a “termite letter” because it addresses more than just termites. As noted before, the Wood Infestation Report is used to report the presence or apparent absence of any wood-destroying organisms, or their damage at the time of the inspection. The inspection for fungi, decay damage, and excessive moisture conditions is limited to those parts of the structure that are below the level of the first main floor. This essentially means those parts of the wooden substructure that are visible and accessible from the crawlspace or basement. It does not include the window sills, soffits, or any portion of the structure higher than the level of the first main floor. It is worth repeating that insect damage must be reported wherever it is visible. How Beneficial is a Wood Infestation Report, if It Doesn’t Guarantee I Won’t Have Termites? The Wood Infestation Report is only one part of the evaluation of a structure. Buyers and lenders rely on the report to provide information about the treatment history and current condition of the home with respect to wood-destroying organisms and their damage. This information is an essential part of the negotiating process of buying a home. The Wood Infestation Report is not a guarantee that there are no wooddestroying organisms. It is a report of the apparent absence of wood-destroying organisms at the time of the inspection. Wood Infestation Reports provide valuable information for the sale of a home, and document its present condition for future reference. Wood Infestation Reports also highlight potential problem areas. Below are some other things that buyers should look for. These may or may not be reported on the Wood Infestation Report. Cracks in foundation walls. It only takes a crack 1/32 of an inch wide to give termites and other wood-destroying organisms hidden access to a house. Leaking pipes and faucets. Termites and other insects seek out moisture for survival. Leaking pipes can keep wood and soil continually damp and create a perfect home for termites. Wood debris around and under a house. Pieces of scrap lumber or firewood kept next to a structure can help support a colony of termites. Sprinkler systems placed near the outside wall of a structure. Excessive watering can speed the breakdown of pesticide treatments around foundation walls. Who’s Responsible for Obtaining a Wood Infestation Report? The Department of Pesticide Regulation recommends that the purchaser of the structure obtain the Wood Infestation Report. This places the service provided by the Pest Control Operator into proper perspective, i.e., to report all readily visible and accessible wood-destroying organisms and their damage. And, it ensures that the person with the strongest interest in full disclosure—the buyer—is also the person paying the Pest Control Operator for the report. Who is Responsible for Treating or Repairing the Damage Found? When Pest Control Operators find wood-destroying organism activity or damage, they are required BY LAW to report it on the Wood Infestation Report. If they do not, the Department of Pesticide Regulation will take appropriate enforcement action. A Pest Control Operator may submit a bid to treat and stop such activity; however, it is up to the seller/buyer to obtain a contract to have the activity stopped. Often, a Pest Control Operator is not prepared to make damage repairs. A building expert would then be called in to make the repairs, and the repair invoice attached to the Wood Infestation report by the realtor/closing attorney to show that the damage has been repaired. How Can I Close the Sale of the House if There Is Damage or Infestation on the Wood Infestation Report? If damages are found, then a qualified builder should be consulted to determine if repairs are necessary. If they are, then the builder’s invoice indicating that the repairs have been completed should be forwarded to the mortgage company along with the original Wood Infestation Report. It is neither necessary nor a good idea to have the PCO re-inspect after repairs have been made – he’s already said once that he didn’t have the expertise to evaluate repairs, after all. If an infestation is found then the PCO’s invoice for the control of that infestation should be forwarded with the original Wood Infestation Report. It is appropriate for a PCO to issue a letter indicating “no infestation” if he has recently treated the house and issued a contract, even though the infestation may not have died out yet. What Factors Should I Consider When Choosing a Pest Control Company? Friends, neighbors, and co-workers are often excellent sources of referrals, or you can ask the company for references. The Department of Pesticide Regulation maintains enforcement histories of all firms, and while we cannot make a recommendation, you may review this part of the public record by visiting the Enforcement History Database on our website at http://regfocus.clemson.edu/dpr/greenbook.htm. Isn’t the Pest Control Operator Responsible for Reporting all Types of Structural Damage? No. Often, a Pest Control Operator is the only individual who goes beneath the house or in the attic. Because of this, the Pest Control Operator is often considered responsible for inspecting and reporting anything that may be wrong with the structure. This is not true. Structural and electrical problems, plumbing, roof leaks, etc., are not normally their areas of expertise. Building Inspectors and contractors who are licensed or registered with the South Carolina Residential Home Builder’s Commission are the appropriate people to call to inspect these problems. Have all the questions been answered? Are the answers consistent, and do they make sense? Are all “yes” answers adequately explained on the back of the form? Do the explanations make sense? 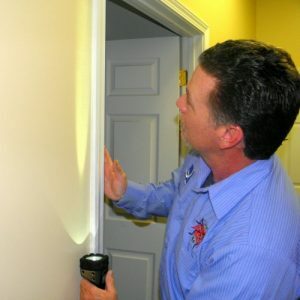 Was inspection by a qualified building expert recommended? Did a building expert inspect and report? Is the Wood Infestation Report consistent with other known information about the house? “Previous infestations” with no treatment: Structural infestations do not normally “go away” on their own. Signs of infestation; therefore, suggest a continuing infestation until proven otherwise (e.g. treated). Old house borers, however, rarely re-infest structural timbers more than 25 to 30 years-old. Damage with no infestation identified or no location specified: Likewise, if there is damage, then there has to be a cause. The organism which caused the damage must also be reported. The location of the damage must also be specified. Vague descriptions or specifications: All “yes” answers must be described on the back of the form, including the extent and location of all damage and infestation. Widespread damage may, of course, be described as such. Inadequate explanation of inaccessible areas: All inaccessible areas must be detailed on the reverse of the form. Almost all houses have some inaccessible areas. Reports that do not indicate inaccessible areas cover the entire structure. Detached structures, however, are not included in the report unless specifically noted. Unacceptable or excessive exceptions: No report should exempt more than a small portion of the house except under very unusual circumstances. If significant areas cannot be inspected, then alternative arrangements should be made. This may be as simple as providing the technician with a key or a ladder, or it may require extensive modifications of the structure itself. Any “yes” without explanation: All “yes” answers require explanation. Period. Any question not answered, where a choice is available: Likewise, all questions must be answered. Damage not located or explained: All damages must be identified, located, and evaluated. If the evaluation of the damage is beyond the ability of the Pest Control Operator, he may choose to indicate that a qualified building expert be consulted. Repairs indicated but “no damage” reported: Unless every bit of damage was removed, some damage must still be present. If no further repairs are necessary, it must be reported. No moisture readings: The Wood Infestation Report requires that decay damage, moisture conditions, and wood moisture content readings be evaluated and reported. Any Pest Control Operator not using a moisture meter is not following regulations.